What is a Crowd Challenge? 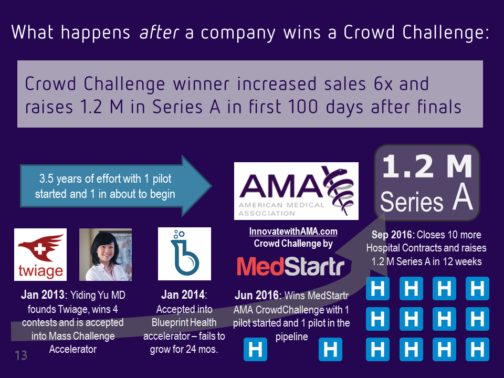 A Crowd Challenge is a two-phase contest where ideas are submitted to compete for the most market validation from a large online healthcare audience. Five to fifteen team are selected to compete in front of a live and vast online audience with partners and expert judges. What makes a Crowd Challenge Different? The difference between a Crowd Challenge and a typical Challenge or Pitch Contest is that here teams compete to see whose company can gather the most support from an enormous crowd of Patients, Physicians, Nurses, Hospital Leaders, Partners, and Investors in an online crowdfunding showcase. Another difference is that all the pilot, partnership, mentorship, and investment dollars go to the teams - so not only do the top teams win, often the top 50 teams win thousands of pilots, partnerships, adoptions, customers, investors, mentors, and more. See a great example in this contest we ran for the American Medical Association in 2016. It is not unusual to drive millions in new business for thousands in prizes. Simply complete the online application. Click here to get startd! Once submitted, the projects will be briefly reviewed and made live after the Crowdfunding Showcase opens. You will be notified of acceptance of your submission via email. Phase I: Let the Crowd Validation and Feedback Begin! ussions in just 28 days. The winner of the Challenge went on to close 12 new hospital contracts (up from 2) and 1.2 M in Series A funding in 100 days. The projects that get the most crowd validation from site visitors will be judged by a panel of healthcare leaders and experts to select the top projects. The top teams will then be invited on stage at a large event or Conference to pitch their ideas in front of a live audience filled with investors, partners, healthcare leaders and a panel of judges who will make the final determination. You can enter your project at any time during the application period, but there is an advantage to those who do so earlier as they have more time to get Crowd Validated. Don't Delay, Apply Today!